Welcome to Vic’s Sports Center! 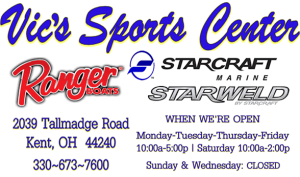 2019 is our 26th Anniversary proudly serving the Ohio, Michigan, Pennsylvania, New York and West Virginia fishing and boating communities, and worldwide across the Internet as your Ranger, Starcraft, and StarWeld boats dealer. Our simple and straightforward mission: Work together with you to find the perfect new or pre-owned boat that matches your style of fishing, the waterways you fish and your budget. To exceed your every expectation with our service and experience to achieve your complete and total satisfaction – because that’s the way it should be. Vic’s offers a full lineup of the finest high-performance bass and walleye fishing boats from Ranger, Starcraft and StarWeld ready for delivery, and you can add your personal color choices to many factory ordered Ranger sport fishing boats should you desire that truly unique machine.